Ride begins at 10:00 am sharp. Riders will be police escorted south on Hwy 441 and Hwy 27 through 4 towns to CR48 and Hwy 27 in Okahumpka heading east on CR48 to Yalaha. The Haven shelter for abused women & children and the Kids Central Inc. relative caregiver program. Please come and ride with us on Saturday, November 19, 2011, to help make this Christmas special for the children, women, and families in the care of these fine organizations that operate in and for our community. The parade will be escorted from the Villages Town Square to Okahumpka along Hwy 411 south and Hwy 27 south. At Okahumpka the run will head east on CR48 to Chet Blackmon's property in Yalaha. Come join the fun and help makes a kids Christmas special. Win a trophy for the best Christmas theme decorated motorcycle. Food, fun and a lot more! 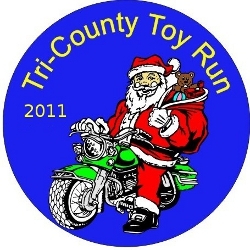 Download the 2011 Tri County Toy Run Flier.